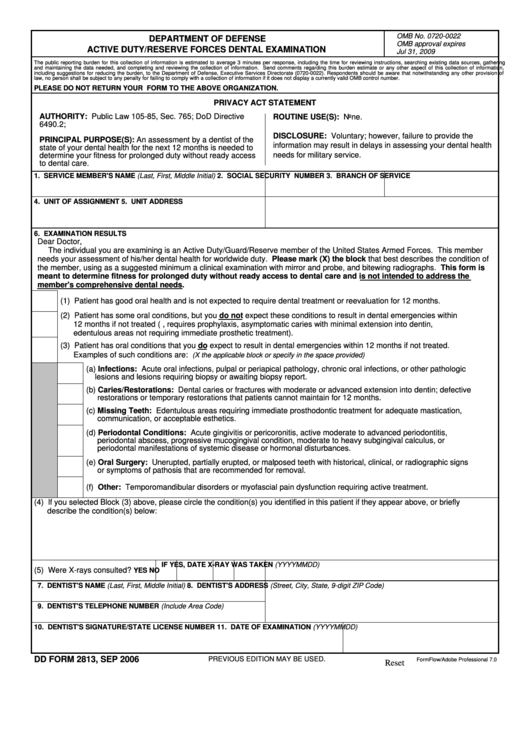 Download a blank fillable Dd Form 2813, 2006, Active Duty/reserve Forces Dental Examination in PDF format just by clicking the "DOWNLOAD PDF" button. Complete Dd Form 2813, 2006, Active Duty/reserve Forces Dental Examination with your personal data - all interactive fields are highlighted in places where you should type, access drop-down lists or select multiple-choice options. (1) Patient has good oral health and is not expected to require dental treatment or reevaluation for 12 months. edentulous areas not requiring immediate prosthetic treatment). (3) Patient has oral conditions that you do expect to result in dental emergencies within 12 months if not treated. lesions and lesions requiring biopsy or awaiting biopsy report. restorations or temporary restorations that patients cannot maintain for 12 months. periodontal manifestations of systemic disease or hormonal disturbances. or symptoms of pathosis that are recommended for removal. (f) Other: Temporomandibular disorders or myofascial pain dysfunction requiring active treatment.